An alternative to the standard VAT scheme is the Flat Rate scheme. This is where a business will charge VAT to its customers as normal but will pay HMRC a set percentage of the total sales (inclusive of VAT) rather than offsetting the VAT paid to suppliers. This can be beneficial for businesses such as consultants who do not incur many expenses which are subject to VAT. It can also make life easier as the VAT returns are simpler to complete on this scheme. There are certain restrictions for joining the flat rate scheme and there is an application form that needs to be submitted to HMRC, so it's a good idea to talk this over with a professional first. 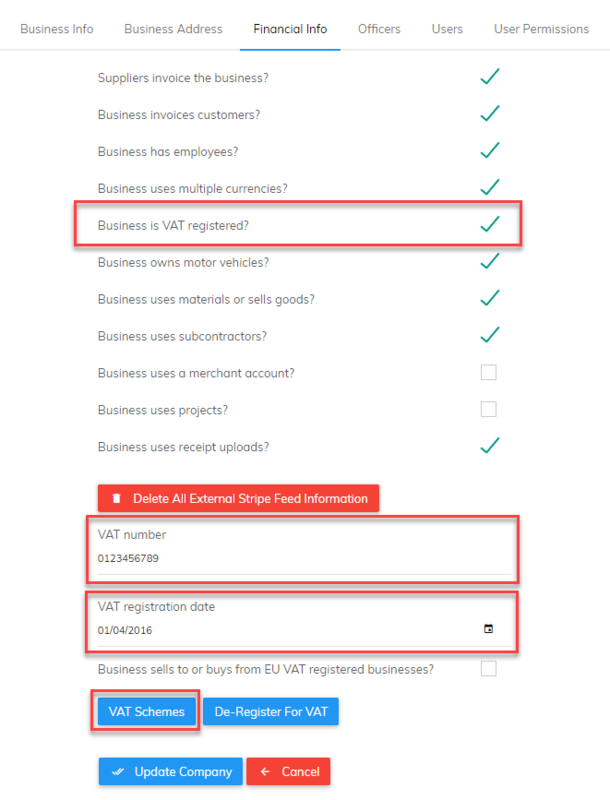 Please then click the checkbox to tell Pandle that your business is VAT registered, enter your VAT registration number, the registration date and click 'VAT Schemes'. Then click 'Add VAT Scheme'. You can then enter the start date of the scheme registration, the scheme type and the flat rate percentage. Please enter the full percentage as Pandle will calculate the first year's 1% discount from the VAT registration for you. If you are changing from a different scheme, Pandle will take care of the switch over, i.e. no discrepancies will be caused. When creating your invoices and entering expenses you still need to use VAT code 'ST' as normal. The flat rate percentage is applied at the point you run your VAT return. Pandle will calculate the amount you owe based on your flat rate percentage and transfer it into the category 'VAT Owed to HMRC'. You will also notice another category called 'Difference in Flat Rate VAT'. This category will show the difference between the VAT due on the Flat Rate Scheme compared with the VAT that would have been due on the standard VAT scheme. If it's a credit balance it means you are benefiting and if it's a debit then it means you are losing out on the Flat Rate Scheme. You can only have sight of this information if you use VAT code 'ST' on the relevant expenses. If you use tax code 'NV' on your expenses (this is an option), then the VAT return will still calculate correctly but you will not be able to see the difference in the liability between the Flat Rate and Standard Scheme.